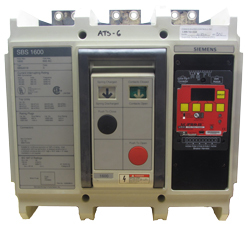 SBS2020 SIEMENS INSULATED CASE CIRCUIT BREAKER, SB SERIES, TYPE SBS, 3P, 3PH, 2000A FRAME, RATED FOR 2000A AMP MAX, 600V, 100KA@480V , BOLT-ON TYPE, SOLID STATE CONTROL, LONG-TIME, SHORT-TIME, INSTANTANEOUS & GROUND FAULT TRIP FUNCTIONS. MANUALLY OPERATED. THIS SIEMENS SBS2020 CIRCUIT BREAKER CAN BE PROFESSIONALLY RECONDITIONED, SERVICED, AND PRIMARY INJECTION TESTED BY OUR PROFESSIONAL CIRCUIT BREAKER TECHNICIANS. THIS BREAKER COMES WITH CERTIFIED TESTING REPORTS AND A 1-YEAR WARRANTY. WE CAN ALSO RETROFIT ANY SB SERIES CIRCUIT BREAKER WITH A NEW AC PRO II TRIP UNIT. THIS UPGRADE WILL ADD NEW FEATURES AND INCREASE THE RELIABILITY OF YOUR SED OR SEF CIRCUIT BREAKER.